Bizagi lets you use the Management Console to manage the information of external systems and applications integrated in the processes. Manage this information (Interfaces and ECM parameters, connected databases through Replication and Virtualization, etc) separately for each of the project's different environments. The options presented next, are available through the Management Console. For general information about this tool, refer to Management Console. 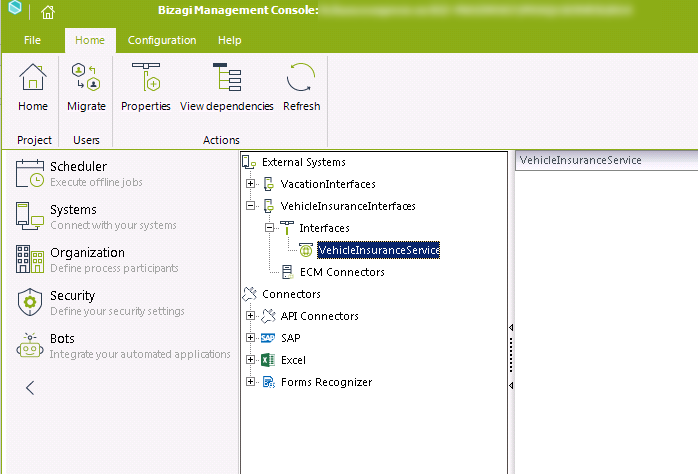 •Connectors administration: To edit connection parameters (typically authentication credentials) involved in the use of a Bizagi connector. •SAP administration: To edit connection parameters to for SAP system integrated through the use of Bizagi SAP Connector. •Web services administration: To edit values set in external services invoked from Bizagi processes. •Data sources administration: To follow up or edit values set for connected databases (Replicated or Virtualized entities).